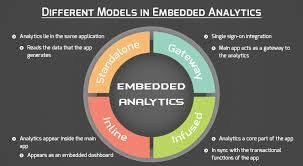 By George Leopold Enterprise applications increasingly come with embedded analytics features such as data visualization tools that serve to differentiate products from each other while helping businesses hang on to customers while attracting new ones, according to a vendor study of the embedded analytics landscape. The annual survey released this week by Logi Analytics found that embedded analytics—the integration of analytics capabilities within business applications—continues to make headway among application developers. The survey found that 85 percent of respondents said they have embedded analytics within their applications. The Logi Analytics survey estimates that embedded analytics now accounts for more than half the value of business applications. “It’s increasingly difficult for applications to compete without offering analytics,” the company asserts. As analytics are embedded within more applications, the survey found that developers are moving up the value chain to offer new features like data visualizations, interactive dashboard and predictive analytics. Along with predictive analytics, survey respondents cited a range of future embedded analytics features. They included AI tools, the ability to “write back to the database,” natural language generation and the ability to launch new work flows. All are seen as ways of differentiating emerging applications from competitors. Product differentiation, cited by 62 percent of respondents, was seen as a key attribute of embedded analytics. Seventy-one percent of those polled said the integration of analytics into software applications resulted in increased company revenues. Embedded tools also are touted as promoting the steady shift toward self-service analytics that help users find their own new data sources, for example. That, in turn, frees developers to concentrate on core applications. While about half of survey respondents said the embrace of embedded analytics has reduced the number of “ad hoc requests” received by developers, 31 percent said they saw no change in the number of requests. Previous Logi Analytics surveys have argued that embedded analytics is overtaking traditional business intelligence tools as analytics are folded into more applications and as users seek greater functionality. Hence, the vendor argues that the standard developer approach of using open-source libraries to build custom applications only works until customers demand more sophisticated capabilities. Meanwhile, so-called “bolt-on” tools fall short in terms of functionality. “Homegrown solutions are failing to keep up with market innovation,” the vendor survey argued. Customer demand for data visualizations ranked highest (77 percent) followed by interactive dashboards and reports (65 percent), then self-service analysis capabilities and data preparation (both 63 percent).